Do you intend to teach public classes? If so, you will be a pre-natal teacher. Thise is a sampling of my offerings. Please feel free to propose other topics – specific topics in yoga philosophy, history, asana, pranayama, or mediation – or propose a custom offering by combining elements of these, especially as related to teaching yoga. Description: The heart of this workshop is about becoming more self-aware, self-accepting, and self-actualized, on the mat, off mat, in practicing and in teaching. It's about becoming clearer about one's life path, what the yogis and spiritual philosophers call dharma. We go deeply into self-exploration to discover our deepest longings and inhibitions, fears and joys, obstacles and possibilities. We use breath work, guided meditations, visualization practices, reflective writing, one-on-one sharing and other tools rooted in ancient to modern yoga and other self-transformation traditions to reveal our hidden truths, passions, and potential for living the most extraordinary lives in the here and now. Rather than suggesting that everyone should take a particular path or adopt a given philosophy of life and action in the world, here we allow these insights to emerge from the inner reality of each and every unique being. Format Options: How deep to you want to go? Lighter fare in a 3-5 hour workshop, pretty deep in a 1-2 day intensive, or as deep as it gets in a 5-7 day retreat. Description: This workshop builds on prior learning about all the families of poses (standing poses, backbends, inversions, etc.). Here we focus on how to design complete classes based on the informed ordering of poses. The basic question we address is, “why this pose before or after that pose?” Rather than random or excessively creative sequencing, this workshop is based on how the body works (in terms of functional anatomy, biomechanics, and subtle energetics) and how to make the practice of asanas as safe, accessible, and yet as deep as possible. 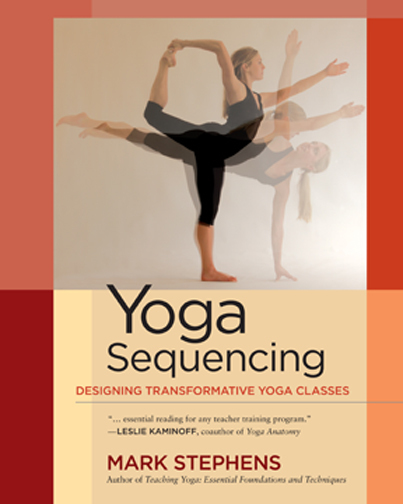 Includes a two-hour lecture on the essential principles of sequencing and in-depth presentations on how to link poses within and between families of poses. Participants collaborate in small groups to craft a variety of classes for different levels of students, styles of yoga, and class intentions; these are presented to the entire workshop for discussion, critique, and refinement. Applies and expands prior learning about functional anatomy, bio-mechanics, kinesiology and other elements of the practice. Description: Skillful, appropriate, and informed touch and clear verbal cues have the potential to transport students to a more conscious awareness and self-refinement in their yoga practice. But before we touch and speak we must first see and understand the unique qualities present in an individual student's practice. In this workshop, we further develop postural observation skills; learn and practice effective hands-on adjustments that both address common misalignments and encourage inner guidance in a variety of poses; enhance the skill of linking clear verbal cues with tactile cues; and deepen confidence in the practice of giving and receiving as participants learn to better help students find joy and ease amidst the challenges in their practice. Description: Here we look closely at transitions into and out of poses as well as the fundamental alignment principles, risks and contraindications, energetic actions, modifications, and variations for each of the constituent postures found in dynamic sequences. Detailed breakdown of classical sun salutations, surya namaskara A & B, dancing warrior variations, lasya vinyasa, and sirsasana II arm balance vinyasas. Description: Detailed exploration of the major standing poses. After close study of Mountain Pose (Tadasana), the foundational asana for all other standing poses, we look in detail at up to twenty-five of the primary standing poses. With each pose, we step into the Yoga Lab to learn how to look at, see, understand, and relate in a meaningful way with effective verbal and hands–on cues to students who exhibit different challenges and tendencies in that particular pose. Also covers how and from what vantage point to best observe and demonstrate, helpful modifications and use of props, and variations for students who can go farther. Description: Detailed breakdown seven core strengthening and opening practices and application of an awakened core to up to fifteen arm balances and inversion poses. Standing poses are explored in their sub-families: internal rotation, external rotation, and standing balance. With each pose, we step into the Yoga Lab to learn how to look at, see, understand, and relate in a meaningful way with effective verbal and hands–on cues to students who exhibit different challenges and tendencies in that particular pose. Covers benefits, risks and contraindications, alignment principles and energetic actions. Also covers how and from what vantage point to best observe and demonstrate, helpful modifications and use of props, and variations for students who can go farther. Description: Detailed breakdown of up to seventeen backbends and seven seated and supine twisting poses. These two families are covered together because twists offer the essential counterposes to a sustained backbend practice. With each pose, we step into the Yoga Lab to learn how to look at, see, understand, and relate in a meaningful way with effective verbal and hands–on cues to students who exhibit different challenges and tendencies in that particular pose. Covers benefits, risks and contraindications, alignment principles and energetic actions. Also covers how and from what vantage point to best observe and demonstrate, helpful modifications and use of props, and variations for students who can go farther. Description: Detailed breakdown of up to fifteen forward bends and hip openers. These two families are covered together because they a) share many basic forms and energetic elements, and b) are ideally sequenced close together as part of the more calming and integrative part of a practice. With each pose, we step into the Yoga Lab to learn how to look at, see, understand, and relate in a meaningful way with effective verbal and hands–on cues to students who exhibit different challenges and tendencies in that particular pose. Covers benefits, risks and contraindications, alignment principles and energetic actions. Also covers how and from what vantage point to best observe and demonstrate, helpful modifications and use of props, and variations for students who can go farther. Description: This workshop draws from and integrates both the western anatomy and physiology of respiration and the esoteric anatomy and physiology of subtle energy found in ancient yoga practices. We cover the fundamentals of basic yoga breathing (ujjayi pranayama) and how to refine the pranayama experience through several specific ancient breathing practices, including viloma, kumbhaka, kapalabhati, nadi shodana and more recent forms such as holotropic breathing. Covers basic concepts of subtle energy (koshas, prana vayus, chakras, nadis) and how to guide students in cultivating awareness of the principal bandhas in asana and pranayama practices. Format Options: 25–40 hour workshop, or 2–12–hour workshop on selected pranayama techniques. Description: This workshop provides a solid foundation for safely practicing yoga while pregnant and for teachers in safely guiding students in yoga classes, whether in dedicated pre-natal classes or with students in regular public yoga classes. Topics include basic maternal anatomy and physiology; guidelines for asanas specific to each trimester and various pre-natal conditions; adaptations and contraindications for a variety of asana and pranayama techniques; what to expect and how to support emotional changes throughout pregnancy; the creative use of yoga props and hands-on adjustments to ensure safety and support; pelvic floor practices designed to ease delivery and recovery; and breathing and relaxation techniques designed to create more comfort during pregnancy, labor and early mothering. Format Options: 25–40 hour comprehensive workshop, or 10–hour workshop on basic elements of prenatal yoga. Description: Yoga teachers commonly encounter injuries and other special conditions in their students. ACL repairs, strained medial collateral ligaments, carpal tunnel syndrome, rotator cuff strain or weakness, various spinal conditions such as lordosis, kyphosis, scoliosis and spondalolysthesis, recent ankle sprains and strained hamstrings are just some of the conditions that teachers are likely to find in practically every class. In this workshop, we will start with the perspective embedded in the Chinese character for "crisis," which has the dual meaning of "danger" and "opportunity." We will learn how to work with a variety of student challenges, exploring how to turn them into opportunities for deepening the overall practice. We will look closely at specific accommodations for different injuries and challenges, including alternative alignment, energetic actions, use of props, verbal cues and hands-on adjustments. Close examination of how to craft individualized therapeutic practices that support physical therapy protocols and various alternative healing modalities. Description: Subjects cover ancient and contemporary yoga philosophy, including the earliest writings on yoga from the Vedic and Upanishadic periods of Indian history, in-depth exploration of the Bhagavad Gita and Yoga Sutras of Patanjali, the rise of Tantra and the relationship between Tantra and the early evolution of Hatha yoga between the 9th and 14th centuries CE, the origins and evolutionary development of yoga in the West in the 20th century, and contemporary yoga philosophy. Lecture and discussion format. Description: This workshop offers several approaches to guiding meditation in ways that make the practice more accessible and joyful to all who open to it. Covers several techniques, including basic breath-as-mantra, heart-centered, classical mantra, tantric micro-practice, counting, visualization, and traditional methods informed by the insights of classical (raja) yoga. Lecture, discussion, and practice format. 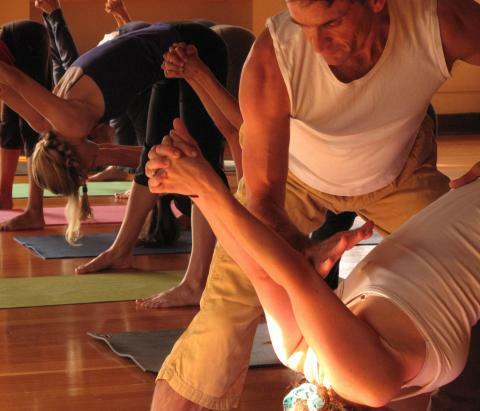 Description: This workshop can focus on the profession and/or the business of yoga. The focus on profession covers the practice of teaching as a professional yoga teacher, professional ethics, yoga teacher lifestyle and livelihood, crafting a yoga resume, understanding teacher compensation, and various aspects of marketing oneself as a yoga teacher. The focus on business covers developing a yoga business plan, the nuts and bolts of developing and operating a yoga studio, human resources, financial management, and how to effectively position and market a yoga studio. A third focus on developing a non-profit yoga organization covers strategic planning for specific non-profit missions, setting up and managing a non-profit organization, grant procurement and other forms of resource development, process and performance evaluation, and marketing. Description: A hands-on introduction to functional anatomy, bio-mechanics and the kinesiology of movement as applied to seeing students in their practice and guiding them in a meaningful, safe, and effective way. Covers the basic language of anatomy, anatomical position, gravitational line, major joints and muscles, innervation, and movement. Detailed coverage of the feet, ankles, knees, hips/pelvis, spine, shoulders, arms, wrists and hands. Description: Arm balances simultaneously require and help us to develop strength, flexibility, focus and openness. These qualities are heightened when movement into the pose involves hip rotation or flexion - poses like Bakasana (Crane Pose), Astavakrasana (Eight Crooks Pose) or the Mukta Hasta Sirsana Vinyasa (a sustained series of interconnected arm balances initiated from Tripod Headsdtand). More concentrated mental focus is harnessed when then moving into poses involve steadier balance, such as Adho Mukha Svanasana (Handstand) and Pincha Mayurasana (Forearm Balance). Practicing these asana sequences safely and consciously leads to equanimity, confidence and personal freedom well beyond the mat. In this workshop we explore how to approach hip-intensive arm balances with proper preparation, patience, intelligence, compassion and integration. We will look closely at the basic elements of each asana and work on cultivating the integrity of these elements as we integrate them into the fuller asana. We will also look at specific wrist and shoulder therapies to better sustain these practices. Along the way we will practice being present to the whole experience of the practice, consciously connecting the breath and bodymind moment by conscious moment. Description: The entire foundation of all Flow-Styles of Yoga is rooted in the dynamic movement of Surya Namaskara, the greeting of the sun and the universe within each of us. It is here that we set the rhythm and mood for all that follows, connecting breath and bodymind in the gradual opening and refinement of the overall practice. In this workshop we will look closely at each of the 12 asanas in Classical Surya Namaskara and Surya Namaskara A & B, exploring their various alignment principles and energetic actions, how the transitions between them can be approached to make them simpler, deeper and more sustainable, and what to be most aware of in guiding others in these movements and asanas. This workshop is designed for all levels of students and teachers, including beginners and advanced practitioners open to practicing beginners mind. Description: Fear of moving into the unknown is just one of the many challenges of backbending. Restriction in the spine, tightness in the shoulders, hips and groins, and weakness in the arms, legs and abdominal core all contribute to the difficulties one might encounter in stretching and opening the front of the body. At the heart of it all is the heart and a lifetime of embodied experience – every joy, trauma, hope and dream from childhood to the present moment pulsating inside to the rhythm of the heartbeat.